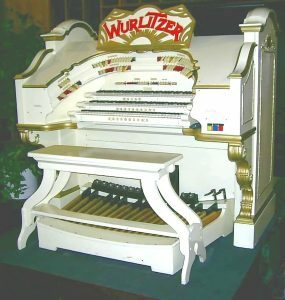 The Wurlitzer now at Burton Town Hall started its life in 1925 at the Cameo Theatre, Cleveland, USA as job number 1165. It originally had 2 manuals and 8 ranks of pipes. Following a fire in the early 1930s, which damaged the console, it was repossessed by the Wurlitzer company and shipped to the UK where a new 3 manual console was added. It was then installed at the Forum Cinema, Wythenshaw, Manchester and was opened on 10th July 1934. The organ remained in the cinema until 1972 when the Burton Corporation acquired it for installation at the Town Hall. Here it replaced an earlier straight concert organ. The late John Bee gave the opening concert on Easter Monday 1973 and the organ has been regularly used since then for concerts, dances and civic functions as well as for private practice. The original 8 ranks were Tibia Clausa, Flute, Violin, Violin Celeste, Diapason, Tuba Horn, Clarinet and Vox Humana. In 1984 the clarinet rank was exchanged for a Conacher Trumpet rank in order to give the organ more “bite”. In recent years the whole organ has been re-leathered and a new solid-state relay system has replaced the original Wurlitzer pneumatic relays. “Blackpool” style couplers were also added at that time. It is the only surviving 3/8 Model F Wurlitzer in the UK which has a fully unified third manual with its own stops, as opposed to a coupler manual. Local organ builder Michael Thompson looks after the instrument and has carried out the recent refurbishment.